← Stowing Gear through Marine Reserves? Seized Fish and Game … What Happens To It? 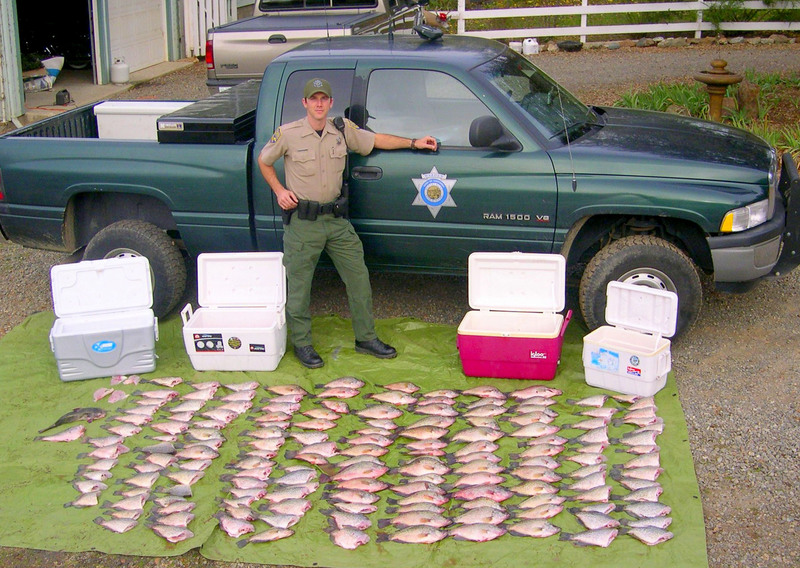 CDFW game wardens, working from an anonymous tip, apprehended three poachers fishing in Clear Lake and seized 151 crappie (76 over the limit). The trio plead no contest and paid stiff fines in excess of $7,200 (CDFW photo from 2007). Answer: When unlawfully taken fish or game is seized, it is kept as evidence until the case is settled or until the judge orders it returned. In most cases though, if at all possible and in good condition, seized fish and game is given to the homeless shelters or soup kitchens that allow donations of wild fish and game. Because of inspection requirements, some facilities may not be able to accept these donations. If a suitable facility cannot be found, the evidence is thrown away or destroyed. In some commercial cases involving commercial size loads, the Fish and Game Code allows for this evidence to be sold and the proceeds may be used by the Department. Answer: Your reading of the regulations is correct on the size of the trap opening, and you are also right about the opening size making it impossible to catch large spot prawn. According to California Department of Fish and Wildlife (CDFW) senior marine invertebrate specialist Kristine Barsky, when that regulation was developed, there was no interest in catching spot prawn recreationally. The reason was because they are found so deep (80 to 100 fathoms) and it is time-consuming to raise and lower traps to that depth when the daily bag limit is only 35 shrimp. In more northern states spot prawns are found in shallower water, but off Southern California they stay deep. The opening was kept small to prevent take of short lobster in this area. As always, you are free to develop suggestions for regulation changes that you may present to the Fish and Game Commission. For more information regarding this process, contact the California Fish and Game Commission at fgc@fgc.ca.gov or visit their website at www.fgc.ca.gov. Answer: Fishing during a closed season is prohibited, period. Even though you don’t intend to take any fish away with you, the definition of take is to “Hunt, pursue, catch, capture or kill fish, amphibians, reptiles, mollusks, crustaceans or invertebrates or attempting to do so” (CCR Title 14, section 1.80). Therefore, despite your best methods, even the attempt to fish is prohibited. There are few exceptions, but the take of crayfish other than with hook and line is authorized under 5.35 (e) when a stream is otherwise closed to fishing. Max rounds in hunting rifle? Answer: Most rifles hold three to five rounds, but the California penal code allows for up to 10 rounds. There are no California Fish and Game Code sections that address limits on the number of rounds a rifle may hold. Remember the Penal Code prohibits the purchase or sale of any centerfire rifle or magazine that holds more than ten rounds. There are many rifles out there that were purchased long before these laws went into effect that are perfectly legal. Many people own .22 caliber rifles with tube magazine and high capacities. These are not outlawed and can be used for hunting small game. Many people have carbines and other rifles bought long ago and they too are still legal even with a 30 round magazine. This entry was posted in Bag Limits/ Possession, Firearms/Ammunition, Invertebrates, Uncategorized and tagged ammunition, Closures, firearms, invertebrates, regulations, seizing fish and game, shrimp fishing, Stream closures. Bookmark the permalink.